Paul O’Connell with 108 appearances is Ireland’s third most-capped Rugby Union player in a career spanning 13 years until his retirement from the game in 2015. 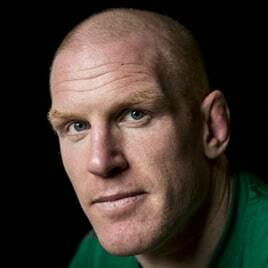 He is also the joint-twelfth most-capped international player in rugby union history. In terms of international silverware Paul can boast four Triple Crowns, two 6 Nations championships and one Grand Slam amongst his silverware indeed captaining the side to the 2014 Six Nations Championship. Paul has the distinction of being selected for 3 British & Irish Lions tours; New Zealand in 2005, Captaining the 2009 tour to South Africa while also being part of the test series winning tour of Australia in 2013. Having lined out for his province Munster on 175 occasions Paul captained Munster to their second Heineken Cup title in 2008 having also been a member of the European wining side of 2006. He also led the side to two Magners League trophies, in 2009 and 2011. Paul is available for Q&A or interview style presentations and corporate launches.